Another cute and fun movie. Harry Brock (Broderick Crawford) is a crooked business man. He heads to Washington DC to bribe some government officials. He brings along his girlfriend, Billie (Judy Holliday in her Oscar winning role), who is ditsy and does not know her way around proper society. Harry is afraid that Billie is going to embarrass him in front of Senators and Congressmen and decides that she needs an etiquette coach. 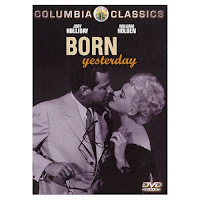 He decides to hire Paul Varrall (William Holden), a newspaper reporter, to help Billie. As he and Billie begin to spend a lot of time together they also begin to fall in love. Billie soon realizes that there is a big world out there and that Harry is not the only man interested in her. The question is what will Harry do when he finds out? I had not heard of this film before and it is a shame it is not as well known as others. Holliday completely steals the film as Billie and the Oscar was very well deserved. Crawford and Holden are also wonderful as the two men in Billie's life. There was a remake of this movie in 1993 starring John Goodman (Harry), Don Johnson (Paul) and Melanie Griffith (Billie). However, the original is in a league all of its own.